Rooms from $108.30 per night. 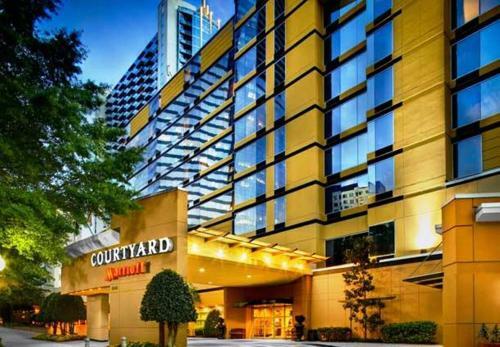 With bright modern decor and an ideal location near shopping and rapid transit the non-smoking Courtyard Atlanta Buckhead impresses our guests. All 181 rooms at the 10-story Courtyard offer free Wi-Fi flat-panel TVs with premium cable mini-fridges free local calling and work desks. The Bistro serves breakfast and dinner as well as Starbucks specialty coffee drinks and evening cocktails. The hotel's business center has corporate guests covered with copy and fax services and everyone appreciates the indoor heated pool and fitness center. Keep up on news weather and airport conditions with the lobby GoBoard. Parking is available for an additional fee and the free shuttle takes guests anywhere within a three-mile radius. The Courtyard is right in the heart of Atlanta's Buckhead neighborhood a half-mile from shopping at Lenox Square Mall and Phipps Plaza and less than 15 minutes from downtown Atlanta the Georgia Dome and Turner Field. Visitors with kids in tow enjoy the Georgia Aquarium also 15 minutes from the hotel. The nearest MARTA light-rail stop is a block away and Hartsfield-Jackson International Airport is 18 miles from the hotel. 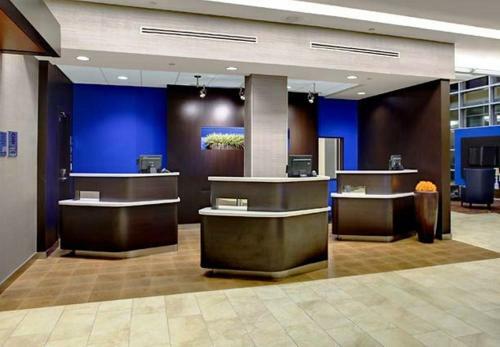 Add Courtyard By Marriott Atlanta Buckhead to your free online travel itinerary.